Exploring Madhya Pradesh cuisine this month with my fellow food bloggers on the Shh Cooking Secretly Challenge Group, I am once more amazed at the sheer variety in Indian cuisine. Not only does each region in India have its own distinct set of food influenced by the environment, climate and availability of produce, each Indian State again has several different types of food preparations. This Makai Ki Sabzi is just one item out of the many that comprise the rich repertoire of food that Madhya Pradesh has to offer. 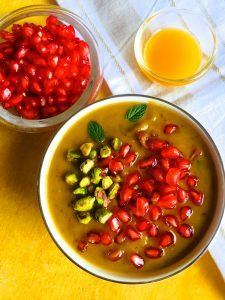 This curried roasted pumpkin soup is chockfull of flavour and texture, what with the rosemary added when the pumpkin is roasted, the mix of Indian spices, the garlic and the mint leaves, the garnish of toasted pistachio nuts and the bright pomegranate arils. Even though the ingredients list is long-ish, I suggest you don’t miss out on any of them to make this dish, as together they make for a very tasty soup indeed. Arhar Ki Khatti Dal – made in the Lucknowi style. I can’t describe how good this dal tastes. This is the first time I’m making or even tasting this kind of sour lentils, and believe me, I realise what I have been missing in all these years of eating dal and rice at least 3 times a week. 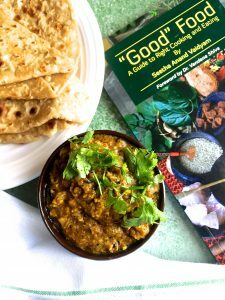 The standard favourite at my home is the simple jeera dal – arhar/towar dal well cooked but not mushy, tempered with garlic, cumin seeds and nigella seed and a fresh red chilli. Now I think the Arhar ki khatti dal is going to take over as the new favourite. This post is part of Pinch Me, I’m Eating’s “2018 Novel Recipes series“, a collaborative collection of posts from food bloggers highlighting recipes that are featured in fiction. Each post includes a book review and a recipe from the novel. I first came across this delicious little book at the lovely book club I am a member of, Bring Your Own Book (BYOB), Bangalore, a few months ago. The discussion and a reading of the excerpts from the book, were mouth watering. I could have borrowed the book to read, but I chose instead to buy a copy for myself. When I come across a nice book, I prefer to own it, specially when the book is about food, history or travel. And in Korma Kheer & Kismet, Pamela Timms writes about all three – her ‘trip of a lifetime from cold damp Scotland’ to Delhi in Northern India leads her to a quest for the stories and the street food in the ‘chaotic medieval gullies of the old City’. Old Delhi is full of the ghosts of history, and the aroma and flavours of food. Pamela takes us exploring the Old City, braving its blistering, blazing heat in summer, the monsoon with its unrelenting and yet glorious rains; relishing the numerous celebrations and festivals from Janmasthami to Ramzan to Independence Day (and the tasty foods specific to each), navigating the dusty twisted by-lanes of Old Delhi, venturing into its twisted streets filled with every conceivable item that a householder would want to shop for, as well as fresh produce, butchers shops, and food ranging from kebabs, kulfi, kheer and kachoris to the chaat shops. The book moves around Delhi and to other cities such as Amritsar as well as recalls some of the author’s experiences with food in France and other places she has visited. Don’t however think that this book is only for Indians or those who know Indian food. 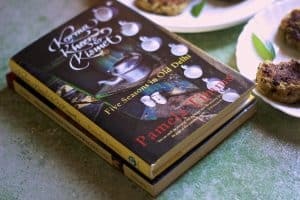 Pamela Timms memoirs are an adventure, a story, a window to food and travel and brings to your minds eye the people, the monuments, the streets, the changing seasons, and yes, the flavours and aromas of Indian street food which no city can offer the way the gullies of Old Delhi can! There are some fourteen delectable recipes in the book, each at the end of a chapter full of the descriptions of food which makes you want to rush to the kitchen or the fridge and whip up a plateful of something spicy and tasty. 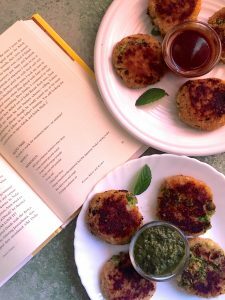 The Aloo Tikki (fried potato patties) were at the end of a chapter describing the monsoon, favourite foods to eat during the rains, and a celebration of India’s Independence Day. 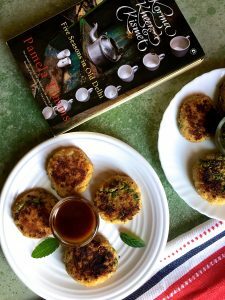 It was an easy choice of recipe for the ‘Novel Recipes: Summer Reading You Can Sink Your Teeth Into‘ series – after all, we celebrated India’s 72nd Independence Day a few days ago, and the monsoons are making their presence felt (tragically disastrously in some parts of the Country). Aloo Tikki it is then, crisp potato patties, served hot, with tongue tickling green chutney and sweet and sour tamarind chutney and fresh yogurt. Sit down with a nice book and cup of steaming tea and plateful of aloo tikkis and listen to the sound of the falling rain! I have deviated from the recipe in the book, in a few aspects. The instructions are for dividing the potato mash into 4 parts and making 4 tikkis. Instead I made 8 smaller tikkis which were easier to fry and handle without their disintegrating in my pan. For the frying pan suggested, I used the almost flat iron pan or Tawa which is a standard in the Indian Kitchen, and added half a tablespoon of oil to start with, instead of one tablespoon. The tikki, I found, does well when shallow fried in very little oil, topped up for each batch. I have learnt, to my cost, that the Tikki shapes up better and is less likely to fall apart when cooked in less oil rather than when deep fried. 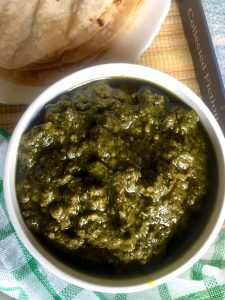 Sepu vadi, ie split Urad dal Vadi in Spinach Gravy, is a traditional recipe from the hilly Northern Indian State of Himachal Pradesh. A very tasty curry, I found it interesting to make. Simple traditional food can be so tasty, and often is comfort food for most of us. This delicious Arbi ki kadhi is one such dish. I made it in the Chhattisgarh style, though there is probably little variation in the method followed in most regions of India. The kadhi takes very little time to make and needs just the basic ingredients you usually have at home. There’s very little prep to be done -boiling and peeling the colocasia/arbi is the main ‘task’, apart from slicing onions. After that it is just whipping the ingredients together and putting the kadhi to cook. Curry leaves and cumin add flavour to the kadhi. It is late January and the weather is shifting from chill to pleasant. Cloudy most days, its just right for hot tasty meals. Time for Nimona or Tehari from my Eastern Uttar Pradesh recipes, both with fresh green peas, or spicy Biriyani, Aloo mutter, Chole or of course, the all time favourite, Rajma. On weekends its nice to make a pot of Rajma Masala Curry and have it with rice maybe for lunch and chapatis at dinner. 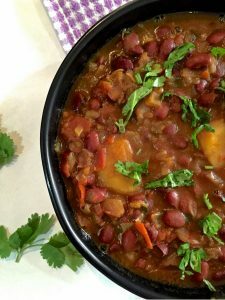 It is also a perfect dish on festive occasions or when there are guests to cater to, as you can serve a great meal with just rajma and rice or roti with a simple salad of onion and tomato slices with lemon wedges. Stir the Rajma well with heavy ladle while sautéing. The more you ‘bhunav’ the masala and the rajma, the better it tastes. Ensure the masala does not catch at the bottom of the pan. Just as in making the Hummus of the right flavour and texture, every step in making Rajma Masala is significant – the soaking, the cooking, making the gravy and sautéing the Rajma, the garnish. 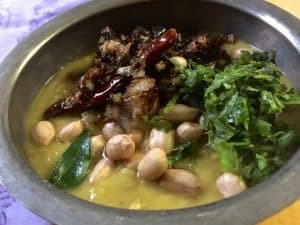 I have tried to share with you all the little things that go to make this curry flavourful, nutritious and easy on the stomach. 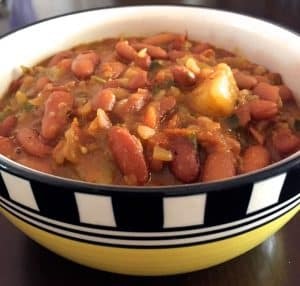 As the red kidney bean is hard and difficult to digest, soaking and cooking till the beans are really soft and fall apart at the touch, is essential. It is definitely possible to soak the beans for just a few hours in hot water, instead of soaking them overnight, but this fast track method does not give the total softness that you will find after soaking them overnight. It is interesting to note that even when cooked very well, the bean still gives texture to the curry and you don’t land up with a mushy dish. Pramod taught me how to make Rajma Masala Curry, and it is a family favourite. Though some of the steps I have followed in this tested and tried recipe may differ from that of popular recipes online, just try making it this way and see how delicious it is. Note: Plan sufficient time for making the Rajma Masala Curry, as, apart from soaking the beans overnight, you may need to pressure cook it twice if it doesn’t cook well the first time around. I have observed that rajma from different sources that I purchase from, have different cooking times. The cooking process below is easy, but it needs patience as there are various steps to be followed. The quantity of garam masala depends on its potency and freshness. Too much of it can spoil the taste. I use a strong garam masala (bought from a speciality store which has maintained the same standards of taste and quality for the last 15 years), so 1 teaspoon is more than sufficient. Serve with hot rice and a salad. Goes well with roti and phulka too. Or even with a lightly toasted focaccia or bread. Thick rajma without its liquid is a nice filling for a wrap or quesadilla. The Beans have a high carbohydrate content, predominantly made up of starch, and are often advised for controlling high sugar in diabetics. This starch is a slow-release carbohydrate, hence it takes longer to be digested than most foods and the resultant rise in blood sugar is gradual and does not cause large blood sugar spikes. Kidney beans have a low glycemic index (the measure of how each food affects the rise in blood sugar after it is consumed). Kidney beans are a good source of various vitamins and minerals including vitamin K1, iron, molybdenum, folate or B9, copper, manganese, potassium, and phosphorus. Studies have suggested that bean consumption may give lower risk of overweight and obesity. Raw or inadequately cooked kidney beans are not advisable as they give risk of toxicity. Use fresh spices to get the best flavours from the Rajma Masala Curry. Recipe 3 of my 100 Healthy Recipes Challenge. 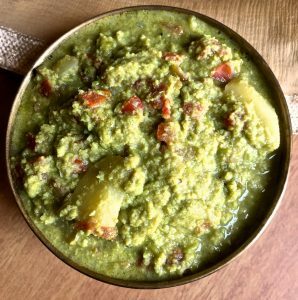 Seasonal green peas make up this delicious Matar ka Nimona, a classic curry from Eastern Uttar Pradesh. The aromatic dal like dish is a regular part of a winter meal in Awadhi cuisine. Married into a family from Eastern UP though settled in Madras, I would listen with my foodie antenna at alert, as my husband started a monologue every winter. He would describe childhood days of enjoying luscious fresh peas straight from the plant, in their native village at Basti, Gorakhpur. I have tasted the peas straight from the plants too, in the kitchen garden my mother had at Kharagpur. However, the magical sight of acre upon acre of pea plants stretching to the horizon, is something I have not experienced. A simple and popular yogurt based dish, Boondi Raita is served as an accompaniment to biryani, pulav or tehri. This dish is even today a regular part of the meal in any home in Eastern Uttar Pradesh. Simple and quick to put together, specially if you have the boondi available. The black salt gives a distinct and pleasant flavour to the raita.